Our specialists are not only passionate about horses but have attended numerous courses to create a better communion with these noble beings. My name is Cristian Breban (Tuti) I am an engineer by trade, jumping over obstacles referee and riding instructor (IGEQ-International Group for Equestrian Qualification) in my free time but more importantly I grew up with horses spending a great part of my childhood, adolescence and the rest of my life with them. As a child I was an obstacle rider but we had to abandon riding because of school. I returned to the world of horses as arbiter of obstacles and riding instructor. 10 years ago I discovered Natural Horsemenship, which fascinated me. 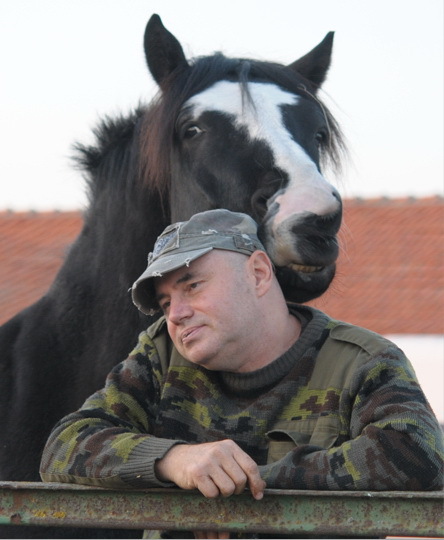 I attended various Natural horsemenship courses in Switzerland with instructors of the Parella NH method, and since then I have been dealing exclusively with this method of communication with horses, unfortunately being one of the few ranters of this methos in Romania. Natural Horsemanship, inappropriately being called – natural dressage, is actually a partnership between horse and man, based on trust and using the language used by horses within the herd in the communication between partners. The Natural Horsemenship principles can be applied to any branch of the equestrian sport, from recreational to performance sports and lead to a harmonious relationship with our partner the horse based on trust and mutual respect. Any of us can safely enjoy the time spent with our partner the Horse, either if we only go on horseback rides or participate in competitions, if we are prepared to invest sufficient time in our relationship, to learn the language and to interact naturally with it. The horse is a generous and noble animal, it never opposes deliberately, the human is the only one to blame for any gaps in communication, because it doesn’t know how and especially when, to convey what it wants from it. I created the HorsEmotion Association to connect people to horses and horses to people, to create a relationship between them, relationship where there is no more fear of each other. I want to give everyone interested in the wellbeing of the Horse, an alternative method of communication with these beautiful and generous animals, without which humanity would not be where it is right now, a method to prevent their abuse. 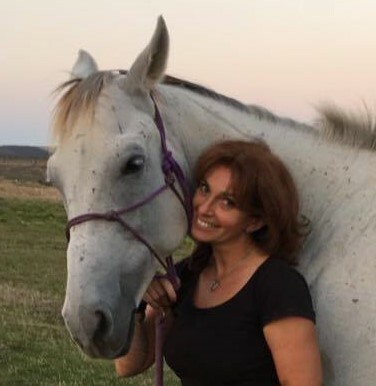 My name Estella Breban, I am a dentist with competence in animal assisted therapy and personal development advisor, convinced adept of the Natural Horsemanship method. Horses have always fascinated me, but I started riding hours only 14 years ago. With the purchase of my first horse, Mirciu, who was very difficult, I realized fear prevented me from living my dream of a friendship with it. Following a series of courses – Natural Horsemenship from beginner level up to the advanced level, I have overcome this fear and found a common language with these noble animals. Now I can safely enjoy long rides in nature with my horse Mirciu and I am happy to share with other horse lovers my experiences in Natural Horsemanship. My dream has been to have a place where happy animals can live in communion with people and this to be for the benefit of all. Thus the HorsEmotion centre from Ianova was born.